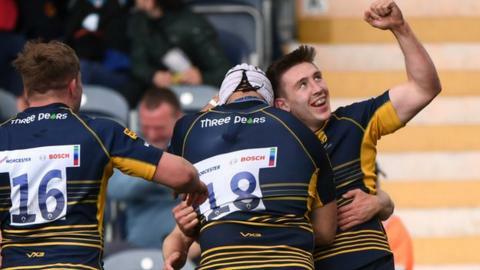 Worcester Warriors' Wales international Josh Adams might be off back to the Principality at the end of the season but he is determined to leave Sixways as still a home of Premiership rugby. The 23-year-old winger has already signed for Cardiff Blues for 2019-20 but notched a match-winning hat-trick in Saturday's win over Sale. And he had to shrug off a thigh injury just to be on the pitch. "I took a bit of a bang against Wasps," he told BBC Hereford & Worcester. "After the Wasps game, I was sore on the Sunday and Monday and it was touch and go. But I had a lot of strapping on and, in the end, I was OK. I never felt it." Although returning to club rugby might have felt a bit flat after his amazing breakthrough season at international level with Grand Slam winners Wales, Adams had already made it clear, the day he signed for Cardiff, that he would continue to give his all for the Warriors. And, in scoring his first Premiership hat-trick, only the second by a Worcester player, he backed up his words with actions. "I've got three more games, then I can think about other things. I said I'd give 110% in every game and every training session and I meant it," he said. "I just want to leave this club in a better place than when I came, as I owe them a lot. "Warriors have been fantastic to me and it'll be tough leaving, but it was something I had to do." Worcester remain in 11th place despite their third win in four home games - but they now have a seven-point advantage over Newcastle. And, just like the bottom club, they have two of their final three games at home, on their three-year-old artificial pitch at Sixways. They now have an extra week's break before hosting Gloucester on 28 April, after which they then travel to Northampton, before the final-day date with champions Saracens. "Two of the three games are here at Sixways," Adams said. "And it's evident that we play our best rugby here. "Newcastle have three left and, if they win all three and we don't, we'll be back on the bottom. "But there's no reason why we can't win all three. Inconsistency has been a problem for us but, on our day, we can beat anyone. "Sometimes it can be difficult to build on a big performance, but we just have to carry on playing like we did against Sale. "It was our offloading game which put Sale under pressure. And, to be honest, I didn't have to do much for my three tries. It was all credit to the boys inside me. All I had to do was dot the ball down. "But it's always nice to get a hat-trick and, for it to be my first for Worcester was extra nice, and on such an occasion too."